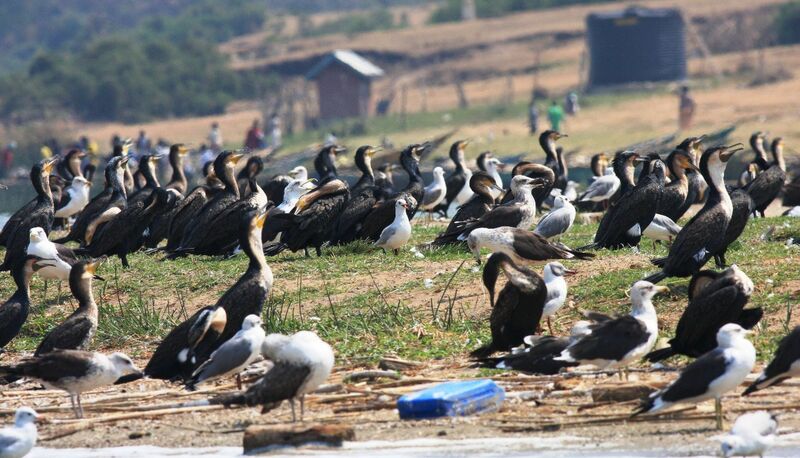 NatureUganda has an established programme for monitoring Important Bird and Biodiversity Areas (IBAs) and has conducted this exercise for three decades. Currently, there are 26 sites where biannual monitoring of water birds is conducted in January and July. The monitoring is a voluntary exercise of NU members supported by UWA as well as the Ministry of Tourism Wildlife and Antiquities, Ministry of Water and Environment, site Support Groups and NU secretariat. The programme is designed to produce a detailed analysis of habitats, trends and migratory bird patterns in Uganda, provides a platform for training of young enthusiastic individuals in water bird monitoring and provides information to lead agencies for evidence-based decision making. During the January 2018 counts, a total of 20 sites were covered including all sites in Ramsar sites and National Parks. Sadly, it was observed that fishing community is having a big impact on birds as a result of poor disposal of the fishing gear. For example, a Grey-headed Gull on Musambwa Island was found stuck with a fish hook and a Pink-backed Pelican was found hanging dead in a tree strangled by a fishing line at Ddimo landing site. A similar observation was made on the Northern channel of Lake Albert where a Little Egret was found strangled in a tree by a string from a fishing line. This is a common observation may signal a threat to the safety of birds as a result of the fishing method and disposal of used nets.